IAAI-10 Was a Smashing Success! The Twenty-Second IAAI Conference on Artificial Intelligence was held at the Westin Peachtree Plaza in Atlanta, Georgia, USA, July 11–15, 2010. The purpose of the IAAI-10 conference is to promote research in AI and scientific exchange among AI researchers, practitioners, scientists, and engineers in related disciplines. On this page, you will find links to the wide variety of programs that were held at IAAI-10. 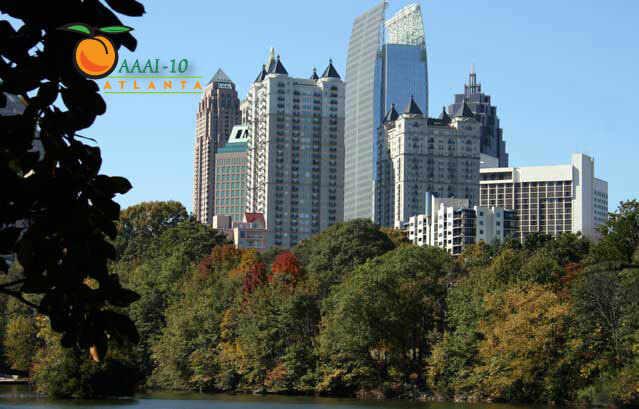 Additional information about IAAI and the AAAI-10 companion conference is available at the AAAI-10 page. We were very excited about our three invited speakers. Marty Tenenbaum, presented the Robert Engelmore Memorial Award Lecture for 2010. Inspired by his career experiences as an AI researcher, Internet entrepreneur and cancer survivor, Tenenbaum explained Cancer Commons, a "rapid learning" community of patients, physicians and researchers..
Majd Alwan, the director of the Center for Aging Services Technologies, described how AI techniques could be applied to mine health and activity data collected in the home to detect indicators of early disease onset, deterioration or improvement, inform providers and allow the delivery of care services, including assistance and support. Finally, Vernor Vinge, a science-fiction writer and winner of five Hugo Awards, discussed several different paths to superintelligence, their relative power, the transformations they might create, and how humans might deal with them. The goal of the emerging application track is to "bridge the gap" between basic AI research and deployed AI applications, by discussing efforts to apply AI tools, techniques, or methods to real world problems. Emerging applications are on aspects of AI applications that are not appropriate for deployed application case studies, or are not sufficiently deployed to be submitted as case studies. This track is distinguished from reports of scientific AI research appropriate for the AAAI-10 Conference in that the objective of the efforts reported here should be the engineering of AI applications. Case-study papers must describe deployed applications with measurable benefits that include some aspect of AI technology. The application needs to have been in production use by their final endusers (typically for at least three months). The case study may evaluate either a stand-alone application or a component of a complex system.